And I can't make cookies because I need more icing. And if I turn on the mixer, I won't be able to hear the shadow of scariness sneaking up on me. And if I don't hear it sneak up on me, how can I terrifying scream as a warning to my youthful neighbors and their partying acquaintances? Also... it might wake up my sleeping children. And they actually do need to sleep because there were some screams coming from this house today that had nothing to do with being eaten by bacteria hive of death leftovers. I think they had something to do with someone looking at someone else and not staying on their own side of the couch. It was really hard to be sure between the crying and the screaming and the CRAYON DRAWINGS ON THE COUCH. Apparently, they said, "Keep Out!" in some language I've never seen before that happens to look exactly like concentric circles. Just because I can't make cookies doesn't mean you shouldn't though. 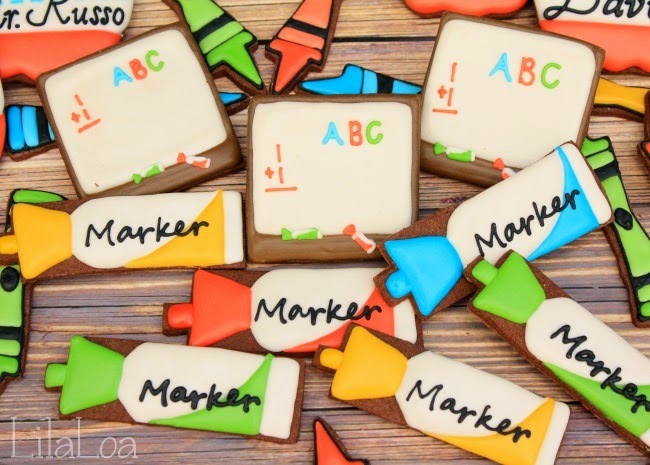 Like these white board marker cookies. And if you give them to your children instead of real crayons or markers... you might be able to avoid the soul-crushing KEEP OUT sofa crayon drawings in your own house. 1. 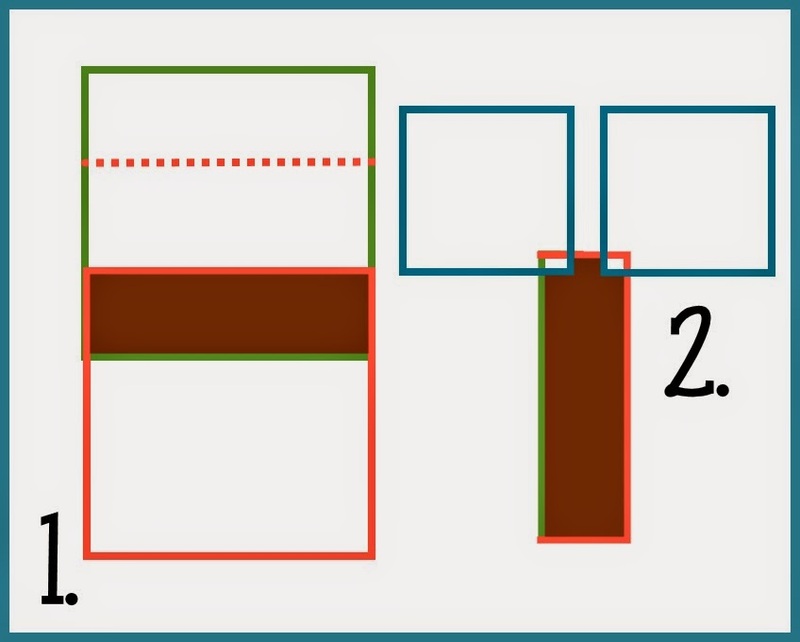 Cut out a square and then use that cutter to cut the square into 3 rectangles. 2. 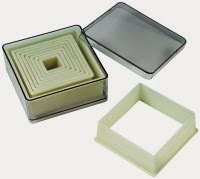 Use the same cutter to cut little squares off the top edge of each rectangle. Sometimes I worry that I make things more complicated than they need to be. After making these, I realized that I could have just used the rectangle from step 1 and not cut out the little top square pieces to make the top of the marker in step 2. PS- This diagram is not to scale. I used the same square cutter for each step. 1. Use 17 count icing and a #3 tip to pipe that shape for the cap up there. I think it has a name... but I can't remember it. Then pipe a swooping triangle for the back half. (Maybe not the actual name of that shape either.) Let it dry for 15 minutes. 2. 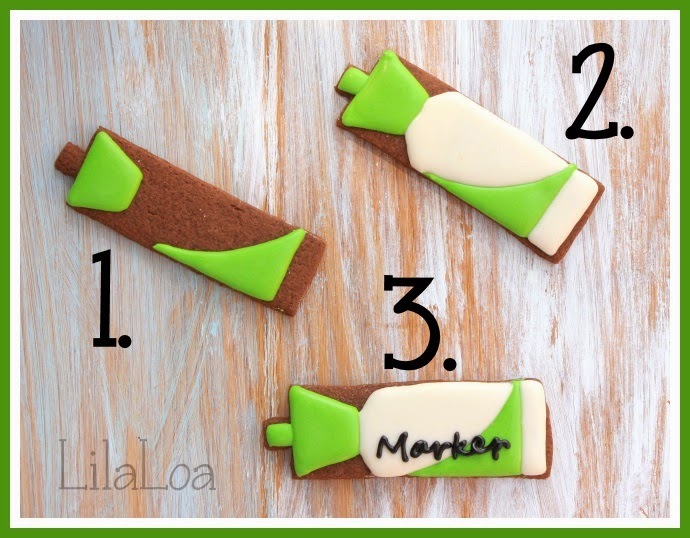 Fill in the rest of the marker barrel with white icing. 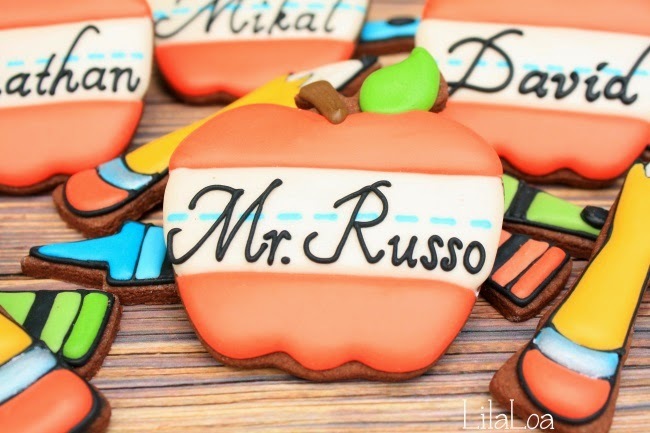 And give the top of the marker that little nudgy part that you so painstakingly cut out. Go ahead and cover that part of the picture with your hand. See? Totally not necessary. 3. 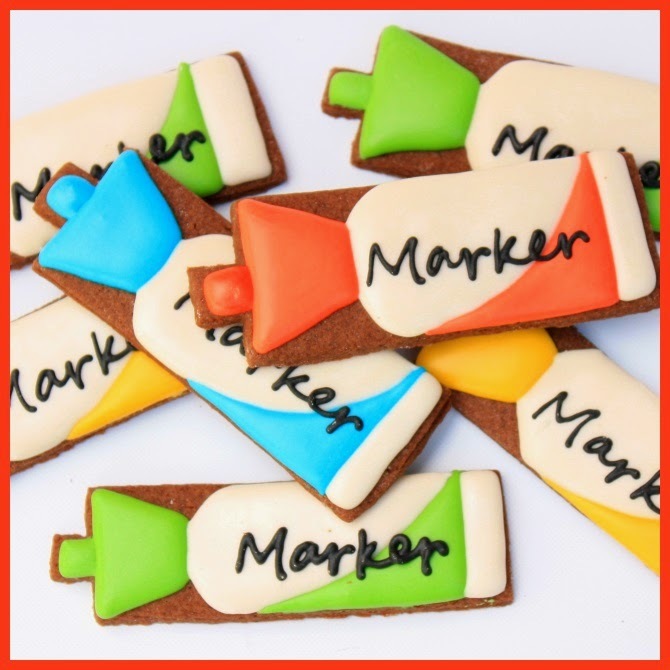 Once the base layer has dried for a few hours, add the word "marker" with thick black icing and a #1.5 tip. I used a KK for the font, but if you let the base layer dry overnight first, you could just scrawl it on their with a food marker first and then pipe over the top. The best part -- it's *supposed* to look hastily handwritten! My favorite set of square cutters... but you could also get this much cheaper set. 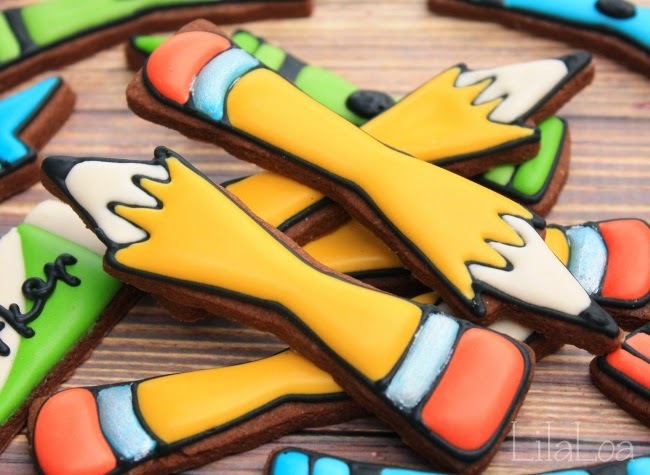 Pencil cookies from a candle cutter.